Quick Words and Quicker Blades! Tumble and stab to your heart's content with the Pathfinder Adventure Card Game Rogue Deck. Explore four different Rogue archetypes in this 109-card set, from stealthy Merisiel to poisonous Wu Shen. 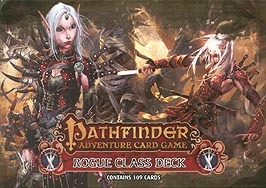 The Rogue Deck is packed with new poisons, weapons, and other goodies to take your character all the way through any Pathfinder Adventure Card Game Base Set, or Pathfinder Society Adventure Guild Organized play campaign. Sneak on!